I have graduated from a catering college in India, risen through the ranks to become a senior Sous Chef at Wildflower Hall , Shimla (Oberoi Hotels & Resorts). I was then presented with the opportunity to work in Dublin at Rasam ,Indian restaurant, which opened in 2003. After several successful years of working in Dun Laoghaire, I moved to the City Center to work in Indie Dhaba. The Tapas Style cuisine was introduced here under my supervision. This style of cooking was acclaimed and applauded by various newspapers and magazines throughout Ireland. 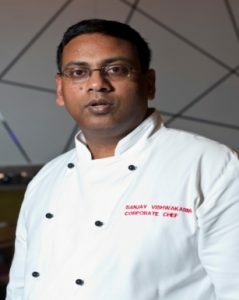 Then having decided to pursue my passion for food and cooking ,I set up my own restaurant and Sanjay Kitchen,Leixlip was born. The cuisine was warmly praised and highly recommended by Paolo tullio. We are currently serving in Birr, Co.Offaly. I am delighted to say that the people here have welcomed this restaurant and my food with open arms. Thank you for taking the time to read this and I look forward to serving you in Sanjay’s Kitchen.